Residents of Rushoroza parish in Kihihi, Kanungu district are living in fear because of stray lions that invaded the area. On Monday five lions escaped from Queen Elizabeth national park in Kihihi sub county into the community. The lions ate two goats in Kazinga village but were dispersed by police and Uganda Wildlife Authority (UWA) rangers as they attempted to run after locals. 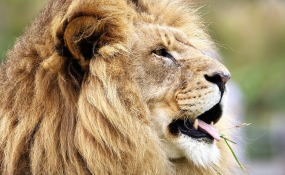 Nelson Natukunda, the Kihihi sub county LC III chairperson, said the officers managed to push back four lions into the national park when they fired in the air. He however, says one of the lions managed to get away and is still at large. Moses Tumuranze, one of the residents of Kazinga village, says the presence of the lion in the area has caused panic among residents. Tumuranze says the remaining lion could kill more animals and harm residents. He says both the police and UWA rangers are yet to return to track down the lion and return it to its habitat. Last month, stray elephant destroyed several crop gardens in Kameme and Matanda parishes in Kihiihi.